‘Bills & Accounts Manager – documents, travel, money & household organizer – Manilla’ by Manilla LLC is an essential life organiser where you can organise your daily life, accounts, bills and finances to make life simple and easier on yourself.. This app is a hit, with good customer reviews and a large download track record, mainly because it is linked to the Manilla system of financial tracking. Manilla’s app has had great reviews from the media, including being ‘App of the Week’ on abc News. With this app you can manage your accounts and bills in one secure place to get a complete overview of your finances. 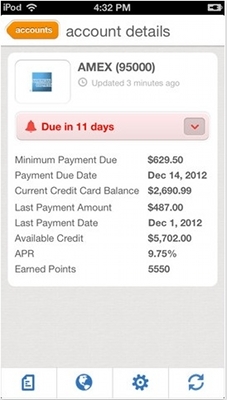 You also get notifications of when bills are almost due, or when reward points are near their expiry date. What type of accounts can be added? With automated access to a staggering 3,500 service providers in the U.S. there aren’t going to be many services beyond the scope of Manilla’s reach. Major banks, credit card providers, cell phone, cable and satellite companies as well as a whole host of other companies have linked up with Manilla. There are 200 utility companies, major airlines, hotels, loyalty programs, magazine and Netflix subscriptions and more included as account types. In fact, the list keeps on growing with more and more companies realising Manilla’s potential benefits. So what happens if you have a service provider that isn’t supported by Manilla? No problem as you can always put in a request to Manilla to support an account type. The Manilla system of bills, finances and account tracking has spread like wildfire when it comes to popularity. Just think of the time saving possibilities of using this app alone. Let’s suppose you have accounts with DIRECTTV, American Express, CitiBank, Cosmopolitan, Town & Country and an Avis and Hertz loyalty program for example. What a headache that would be . . . opening mail, filing bills away in binders, punching holes in paper, buying plastic sleeves, shredding old ones and the odd letter going astray in the post. With this app, you merely have to sign up with Manilla, link the app to enable the Manilla system to pool all of your accounts into one complete overview and hey presto – no more time wasted on outdated filing systems. With the added perk of having some free space in your office where the mammoth filing cabinet once stood, creating more time to be even more effective in your work, or just giving you more time to be with your family, go for a coffee, or do something much more fun than endlessly dull filing in your life. Manilla offers free online document storage where you can store documents, bills or statements. Deleting a document is easy, so you will avoid the usual tiresome shredding of paper documents. This is great because I haven’t met anyone yet in my life who actually enjoys endlessly shredding paper. This also cuts down on clutter as you can send your documents via email, download them or print them out if you need to. This way, the company and yourself can avoid ‘snail mail’ time wasting, sending documents through the post. Oh, and that ugly filing cabinet that makes your office look like a Post Office sorting office can be thrown out. No more boring filing! Yippee! A free app? What’s the catch? You’d think that this kind of convenient functionality to make your life a lot easier would come with a high price tag right? Well, you will be surprised to hear that this app is completely free. “But there must be a catch?” you may ask and the answer would be “No.” Here’s how it works . . . Companies spend a large amount on mail they send out to customers and waste a lot of resources and time doing so. Therefore, by using this app companies do not need to send mail out and you get a free bill manager, a win-win situation all round. On first opening this app you will be required to open a free account with Manilla, this comes with a password and two security questions, plus you will be given the option to enter a 4 digit security pin for faster log-in times. Manilla uses biometric validation and AES 256-bit encryption, in short, top-level security and protection with Manilla’s policies and security status verified and monitored by TRUSTe. You don’t have to worry about a thing as this app comes with layered high-level protection. Manilla is owned by the Hearst Corporation, which owns more than 300 magazines worldwide, including famous names such as Good Housekeeping, Esquire, Cosmopolitan and more, plus being one of the biggest diversified communications companies in the world. So, in a nutshell, this app is backed by a very reputable and respected umbrella company. Never miss a payment date. Everyone at some point has missed a payment date. I even did this personally only recently when a bunch of random events in my life threw me off-track. Then there’s the usual sigh and realisation that you’ll have to pay a penalty fee. Not any more . . . With Manilla it’s almost impossible to get caught out by late payment fees as you get custom alerts by text message or by email, wherever you happen to be in the world. Remember the old way? Scribbling down dates on a calendar and putting sticky notes on the fridge, then the cat knocks the sticky notes down and you forget to check the calendar? Yeah, you know what I’m talking about right? Sound familiar? Well, no more of that nonsense as you can now move along with the times; your calendar will look less like a sketch pad and you will be able to see the true colour of your fridge under all those sticky notes. When I tested this app it only took me a few minutes to sign up and it’s easy to link to an account. Some accounts you will have to verify the link up at each end, such as I found with my PayPal account for example, but this is easy. And that’s the essence of this app: Manilla allows you to effortlessly group all your accounts in one secure place, cutting out all the manual time-wasting processes and getting rid of clutter and ugly piles of paper to boot. This is also an environmentally friendly app as it has no doubt already saved countless trees. This app is not overcomplicated, it’s clearly laid out and saves you so much time! I’m not going to even think about suggesting changing such a streamlined and efficient financial management tool. The system is perfect. However I’d like to suggest to the developer one idea that may further enhance this great free app. Here is my suggestion . . . When I initially opened the app, I was immediately presented with a sign up screen to open up a free account with Manilla. I know that people who have had the patience to research what Manilla is all about will have no problem signing up with glee to such a time-saving system. However, there will be a percentage of downloaders who have downloaded the app on a vague recommendation from a friend, such as being told “Hey, have you checked out Bills & Account Manager? It’s great, download it.” Then on downloading it they may be a little freaked out with the sudden sign up screen immediately appearing if they don’t understand what Manilla is all about. Everyone’s different, some people will read the app description and check out Manilla’s website, whereas other’s will not. You know the type of people I’m talking about here, people who just can’t be bothered to read the instruction booklet when they buy an electrical product for example. Yep, I admit, I’m one of them. This may cause some people in this bracket to abandon signing up, out of confusion or scepticism as to what the Manilla system actually is, and they may be scared of a hidden payment being launched at them after they’ve signed up. Here is my suggested solution, similar to the ‘Quick Start’ pamphlet you get along with the in-depth instruction book with electronics products, and that is to have an introductory quick start overview screen of what Manilla is and how people can be assured that it’s completely free and completely secure, with no hidden payments after they’ve signed up. An overview screen that walks people into the Manilla account creation process, which gives unsure people or individuals who are not technically minded, the confidence to sign up. This is just a suggestion, as the app rocks and is fine as it is. Bills & Accounts Manager is a completely free app and service that will save you money, time and office space by bringing all your accounts into one easily manageable group. It kind of gives you a bird’s eye view of your finances and nudges you when a payment is due. I think it’s a fantastic idea and app and everyone wins, both the customers and the companies who provide accounts. This app should receive an award or press coverage for being the number 1 green, environmentally friendly app on the App Store. Excellent idea and simple to use. Let’s face it, if you have to manage multiple accounts why wouldn’t you download this app? Only a paper shredding and filing cabinet enthusiast would be able to answer that question I think. Fantastic app and system!